Data visualization for storytelling and discovery. Excess body weight is an important risk factor for mortality and morbidity from cardiovascular diseases, diabetes, cancers, and musculoskeletal disorders. It’s the cause of nearly 3 million annual deaths worldwide. Several studies on diferent levels show that adiposity, as measured by body mass index (BMI, calculated as weight in kg over m2), has increased in recent decades in many populations although BMI seems to have been stable or even decreased in some groups. Body mass index is a value derived from the mass (weight) and height of an individual. The BMI is defined as the body mass divided by the square of the body height. Commonly accepted BMI ranges are: underweight: under 18.5 kg/m2, normal weight: 18.5 to 25, overweight: 25 to 30, obese: over 30. Also the World Health Organization adheres to this classification. So those are the line highlights in the Y axis of the graphs, to see which and how many countries fall into them. 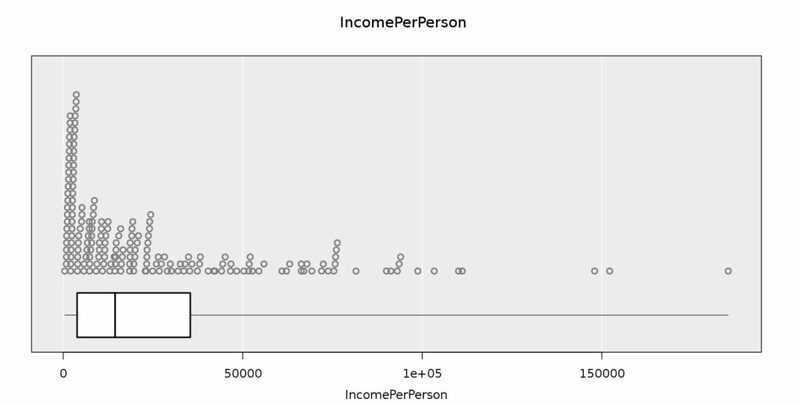 I used the Gapminder 2012 dataset to explore a bit. The mean BMI provides a simplified measure of the comparative weight of populations on a country by country basis, and my first hunch was to compare the mean BMI of each country with the income per person to see how it correlates. Maps didn’t show well the gradients, as the countries that have higher values of BMI are scarce and very small in dimensions in the map. So I used a scatterplot to see countries and also continents by colour, and see the trends. All the countries with an obese population (Nauru, Tonga, Samoa, Palau, French Polynesia) belong to the Polynesia, which may pose the question for an ethnic condition or if it’s considered necessary to use diferent parameters when studying this area. Considering the data for women, there are more countries with more BMI index for women, and also more into the category of obesity. Besides the mentioned before, there’s Kiribati, Marshall Islands for the Polynesian, Egypt and Kuwait for Middle East and Puerto Rico, Saint Kitts and Nevis, and Bermuda for America. This may have some kind of relationship with climate and hot temperatures (? ), as all of them are located near the parallel of latitud 0. Some possible clue to keep on searching. 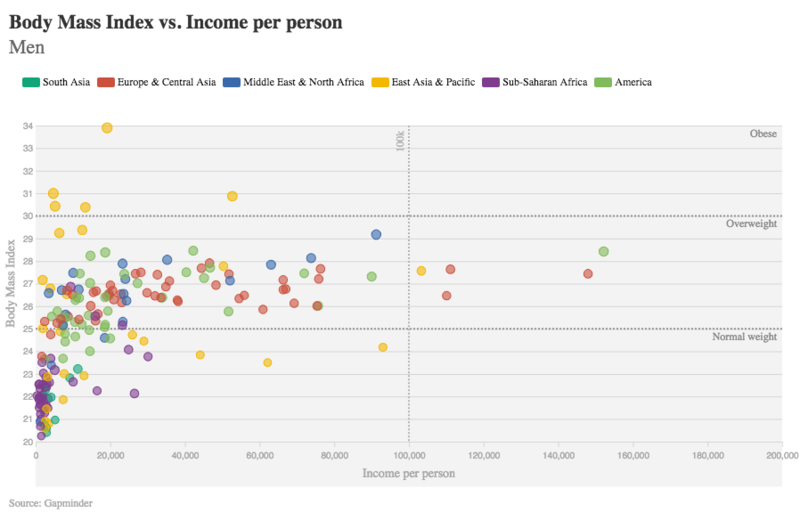 We can see that the BMI and the income doesn’t show a clear correlation in general, so I thought it would be better to filter and to analyse by continent and country more in detail. There are several studies stating that wealth doesn’t have a direct correlation with BMI as there are more factors involved. “The persistence and emergence of income gradients suggests that disparities in weight status are only partially attributable to poverty and that efforts aimed at reducing disparities need to consider a much broader array of contributing factors”, as per Wang and Lauderdale. 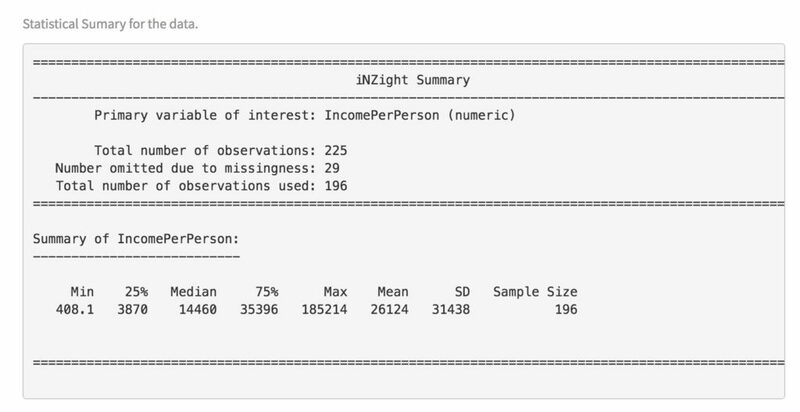 In a study of the University of North Carolina, they employed microdata from China to provide the theoretical examination and empirical test of the predictions linking household income to adult BMI using both cross-sectional and panel data analysis. The results show an inverted-U shaped relationship between BMI and family income. Additional income brings about higher BMI and higher possibility of being overweight or obese for the poor than for the rich. 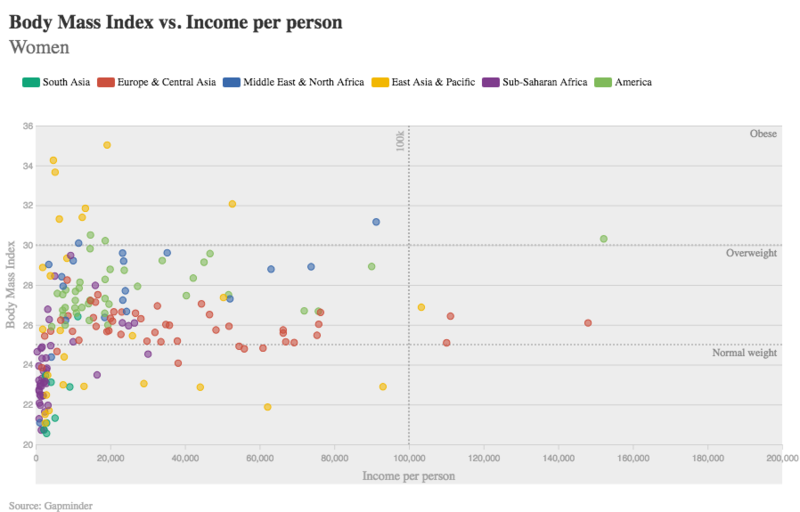 The median of the income per person in the Gapminder data for 2012 is only 14,460, and most of the African countries are under that median. But the rest of the countries are quite dispersed, specially in the case of East Asia and Pacific and South Asia. The discrepancy with Asia has some particular condition. The WHO has determined that at any given BMI, Asians, including Singaporeans, generally have a higher percentage of body fat than do Caucasians. The BMI cut-off levels for Singaporeans have been revised such that a BMI 23 kg/m2 or higher marks a moderate increase in risk while a BMI 27.5 kg/m2 or more represents high risk for diabetes and cardiovascular diseases. 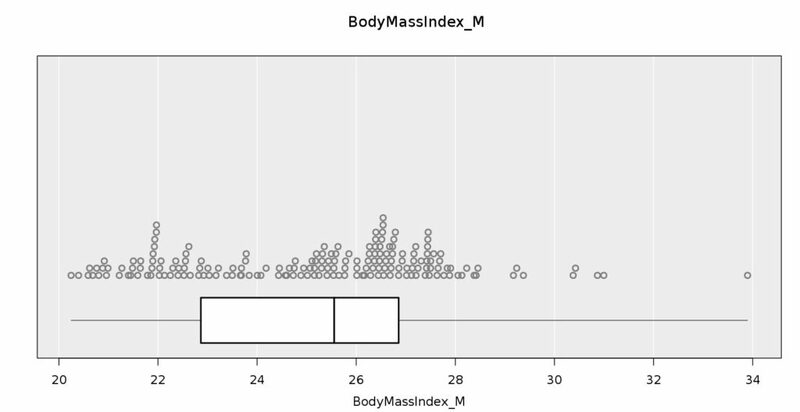 Besides that, and coming back to all the continents data, a histogram showed that the median for BMI is 25.56, similar to the mean, 25.14. So in our analysis, most of the countries fall into the calification of overweight or obese, and as per several experts that’s the biggest problem in terms of alimentation that we have. More than underweighted we are eating bad food and not keeping a good metabolism balance. Also if you are poor and don’t have education you cannot resolve this situations to get the best nutrients and sustainable food at your hand. Education is one of other many variables that can have incidence in the causes of a higher BMI, such as ethniticity, and we cannot establish a serious correlation without searching deeper in other variables. So I wanted to watch how urban population could correlate with the BMI index. Some studies at the national level find the lifestyle of urban people as one of the main causes of higher levels of obesity in cities, independently of income. It’s the case of a study in Brazil that found that urbanization and the more developed geographic regions were positively associated with the prevalence of overweight/obesity and negatively associated with the prevalence of underweight. In the grid of scatterplots by continent, we can effectively see a positive correlation for every group. The Asian look still very spread out, anyway. I’d study them in particular, after revising more papers on their specificities, and wouldn’t include them in a general analysis like this. But for the rest, the correlation is positive. There are a number of reasons for the association between obesity and economic growth in many economies. Technological changes that lead to the lower food prices and increased food consumption are some of the factors that explain economic growth and obesity, as a study by Finkelstein and Ruhm proved. Those factors increase working hours, which makes more people eat in restaurants and fast food joints. 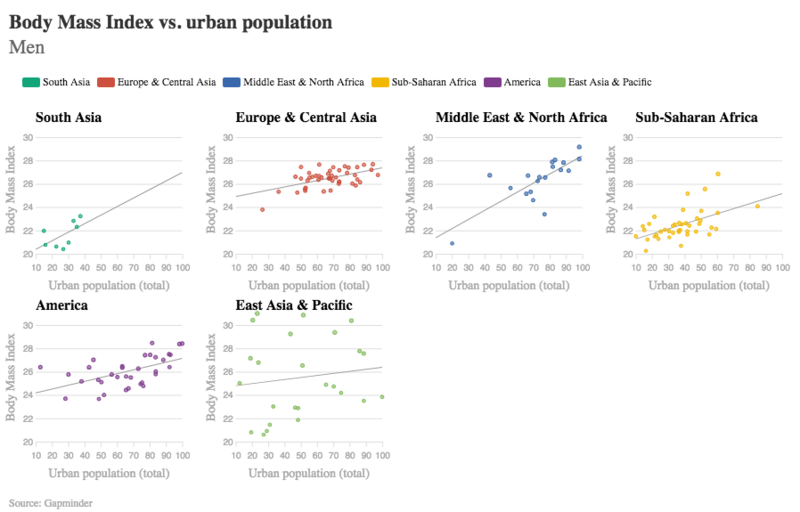 I find this kind of explorations makes us pose more and more questions every time, and I could go on an on trying to find papers on each region and different variables, as I mentioned before, such as education, urban growth (not only total population), differences per latitudes, and so on.